The study of television drama is complicated by the regular regurgitation of inaccurate accounts and misinformation about old programmes. How and why this occurs is easily understandable: anecdotal information from interviews with programme-makers is subject to the inevitable distortions of memory over time, or of exaggeration or invention for the sake of telling a good story (many of these people are performers or entertainers after all). Other sources, such as the national press, are also known to be unreliable. The culture outside academia – and most particularly on the internet – amongst those with an interest in television drama is usually for information and anecdote to be accepted at face value. It is therefore repeated as fact and, whether accurate or not, may be subject to distortion via the ‘Chinese whispers’ process of reiteration. Primary sources of information are often either non-existent or inaccessible, leaving these long repeated accounts unverifiable or at least unchecked. However, original research and the use of reliable primary and secondary sources where available can, in some cases, challenge the flow of generally accepted but inaccurate information (what I shall call ‘myths’ here). To illustrate this problem and how it can be overcome (to an extent), and to provide some new information on an important subject in the history of British television drama, I have made a study of the BBC’s 1954 dramatisation of Nineteen Eighty-Four, which reaches its 60th anniversary later this year. The production is well known to anyone with an interest in the history of British television, both for its technical innovation and for the enormous controversy it provoked. However, it has always been surrounded by contradictory accounts and anecdotes that often failed to have the ring of truth to them (always a good reason to start digging deeper). My researches suggest that much of the widely accepted account of the drama, primarily around the reaction to it and the BBC’s response, is either wholly incorrect, distorted or incomplete. Nineteen Eighty-Four was broadcast on the sole BBC television channel as a predominantly live performance on Sunday 12 December 1954, with a further live broadcast the following Thursday, as was the custom for television plays at the time. The initial broadcast caused much public and media comment, with some suggesting that the second performance should be cancelled. It is often said that Britain’s national press turned on the BBC for their production of Nineteen Eighty-Four immediately following its broadcast. A survey of all the national newspapers of the period shows this to be almost entirely the opposite of what actually occurred. Although a few television critics did not like the play (and one critic did want the repeat banned), the national papers which commented in the row about the production did so almost entirely favourably.1 Newspapers reported public criticism of the play, but in editorial and opinion pieces all the mainstream papers supported the BBC’s choice of plays and its freedom from interference in programming, and argued that the BBC should proceed with the repeat. This editorial comment from the Daily Herald is typical: “We defend the BBC’s right to back its own judgement. Those who dislike it can switch off; they are not appointed to decide what is unfit for others.”2 It’s worth noting that this type of response was seen in papers representing the left, right and centre ground of political thought, with one notable exception. The voice of dissent in the press was that of the Socialist newspaper Daily Worker, which attacked the play on political grounds. It vitriolically denounced the play, Orwell and the BBC for depicting an unappealing future under a tyranny that Orwell had named “English Socialism”. There are two likely causes for the misrepresentation over recent decades of the general press reaction to the play. A number of those involved in the production, but most notably Nineteen Eighty-Four’s dramatist Nigel Kneale, referred to negative press reaction in interviews, with little or no comment on the greater favourable reaction. Secondly, much of the newspaper coverage, in tabloid newspapers in particular, utilised lurid and alarming headlines which give a more negative impression than that gained from reading the articles and editorial comments in full, and these headlines have been reproduced out of context subsequently on television and in print. Whilst on this subject, we can also slay a minor myth which was based solely on one such lurid headline. Nineteen Eighty-Four did not cause a viewer’s death. The Daily Express carried an article headed “Wife dies as she watches”, which has been seen amongst the headlines depicted on television.3 The report states that 40-year-old Beryl Mirfin died of a heart attack while watching the play (and darning), but no link between the two was suggested. Indeed, she was noted to have collapsed well before the more disturbing scenes. Her husband was quoted as saying that she wasn’t a “nervous type” and that “I don’t think the play itself caused her collapse”. This is broadly mirrored by the selections of readers’ letters published by various newspapers, which generally became more positive as the controversy wore on between the first and second broadcasts. It’s not clear whether the written correspondence retained by the BBC in the Nineteen Eighty-Four production file is all that was received or just a sample. The file contains 22 letters or telegrams from viewers, of which seven protest or complain about the play, 14 compliment it or the BBC for producing it, or encourage the Corporation to disregard the complaints, and one which is somewhat cryptic but could be read as a veiled threat to Rudolph Cartier, Nineteen Eighty-Four’s producer.5 Ignoring the latter, the positive reaction is double the negative. However if this is only a sample of the correspondence received we cannot know how representative it is of the whole. It’s commonly the case that people are quicker to make the effort to complain about a programme that offends them than to compliment or defend one that did not. It is my interpretation of the public response that those who enjoyed Nineteen Eighty-Four, or at least supported its broadcast, were largely only spurred to say so by the publication of accounts of the protests received from its detractors, with further correspondence being generated to bolster one or the other camp as the saga unfolded in the press across the week following the initial broadcast. 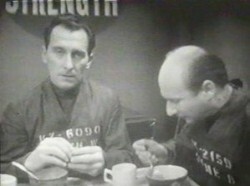 The BBC’s own Audience Research Report records that the first performance scored a Reaction Index of 39 with its sample of viewers, while the repeat scored 54.6 The average Reaction Index for 1954’s television plays was 65, showing that Nineteen Eighty-Four did score poorly, particularly on its first broadcast, although this tells only part of the story.7 The Nineteen Eighty-Four report notes that it was common for a play’s Thursday repeat to score slightly higher than the Sunday origination (suggesting this was probably because the repeat’s audience included some who were viewing for the second time, having so enjoyed the first broadcast), but the discrepancy in Nineteen Eighty-Four’s score was unusual. This likely reflects the effectiveness of the public controversy, and BBC on-air warnings about the nature of the play on the day of the repeat, in deterring viewers who were most likely to react badly to the programme and therefore score it harshly. Equally, others with a taste for such strong material, and who were therefore likely to score the play more favourably, may have been drawn to watch the repeat by the controversy, when otherwise they may not have done so. This conclusion is consistent with press reports of an equalising of public opinion, whilst the upswing in opinion noted from viewers of the repeat likely reflects the aforementioned self-selection of the audience weighting it with sympathetic viewers. Even disregarding the section of the report relating to the repeat, a consistent picture emerges from the BBC audience research and the wider public reaction reflected by national newspaper reports. It’s clear that whilst many viewers did strongly dislike and object to the play, they were at least matched by those who supported it and the BBC’s choice of it for broadcast. We’ve established that Nineteen Eighty-Four did attract many comments of complaint and protest, but the nature of these has often been misrepresented. The usual explanation of these complaints is that viewers objected to the play’s horror, which has been equated with the torture scenes towards its end, particularly the Room 101 sequence. This is only partially true. Several contemporary accounts make reference to telephone calls of complaint being made well before any torture scenes were shown. Two press comments were that the play had “hardly begun” before protests were received and that complaints started “two minutes after the play began”.9 “Such complaints probably arose from political prejudice”, suggested the Daily Mail.10 The Daily Herald reported: “Many BBC officials believe that some of the protests were the result of a campaign by sympathisers of the extreme Left or Right.”11 The latter’s suggestion of a BBC source should perhaps be taken with a pinch of salt, in absence of any direct quote or attribution, but nevertheless it’s notable that newspapers of both the political Right and Left, respectively, make the same suggestion of a political motive behind the early protests. It should also be noted that whereas the complaints about the horror of Nineteen Eighty-Four are usually portrayed as relating largely or wholly to the torture scenes, this is not the impression given by the bulk of comments recorded by newspapers or held by the BBC. Whilst many newspaper reports referred to the torture scenes, not one of the letters or telegrams held by the BBC references them directly, and viewers’ comments published in newspapers only rarely did so. Coverage of the Nineteen Eighty-Four controversy has always lacked context. Disassociating it from the media and cultural landscape of the period has led to it being misunderstood. To understand the outcry, it is essential to understand influences from beyond the programme itself. Horror in the media was a topical subject at the time, following a high profile moral panic about children’s ‘horror comics’ and their alleged link to juvenile delinquency, which played out in the press from around September 1954. In this climate of concern about the effects of horror, any grim or violent television play would have met a frenzy of complaint. Indeed, often newspaper reports and letter writers used the phrase ‘horror comic’ in their remarks about Nineteen Eighty-Four. This isn’t to say that the play would otherwise have passed without protest, but the level of interest Nineteen Eighty-Four received, the extent of the protests and some of the lurid language used in them was undoubtedly influenced by the ongoing ‘horror comics’ outrage. The BBC itself was also under close scrutiny and repeated attacks in the press (plus ça change…) in the weeks immediately around the broadcast of Nineteen Eighty-Four, for reasons that varied from the rudeness of television personality Gilbert Harding and various technical mishaps, to sexual content in television drama (such as the previously mentioned Young Renny case the week before Nineteen Eighty-Four) and the intention to cover the 1945 atom-bombing of Japan in a Christmas Day broadcast immediately before the Queen’s address. Nineteen Eighty-Four was broadcast in an atmosphere of heightened interest in the BBC’s output, with a particular eye for scandal, which helped keep it in the press. By its detractors, Nineteen Eighty-Four was seen and portrayed as just the latest in a string of deviations from good taste and judgement by the BBC, and therefore part of a greater dissatisfaction with the Corporation, rather than as an isolated incident that might have been more readily tolerated. The report noted that this fall-off in viewers between the two broadcasts of Nineteen Eighty-Four was consistent with the usual pattern for Sunday evening plays and their Thursday repeats. The report’s suggested reason for the controversy around the play having seemingly not caused a notable deviation from the usual pattern of viewing was roughly the same as that I advanced earlier to account for the dramatic change in the Reaction Index: the controversy did influence viewers but the publicity both repelled and attracted different viewers, creating an equalising effect. Returning to Kneale’s anecdote about a vote being taken on the repeat, a similar story is told by another member of the BBC staff at the time. George Campey reports that he joined the BBC on Monday 13 December, the day after the first broadcast of Nineteen Eighty-Four, as TV Publicity Officer.34 He explains that he was telephoned by the aforementioned de Lotbiniere, who was running the Corporation’s Programme Board, for his opinion on whether the repeat should be cancelled. Campey suggested proceeding with it, leading to de Lotbiniere breaking the deadlock of a 50/50 vote at the Programme Board and the decision to proceed being made. Sadly, the BBC does not hold minutes for the Programme Board’s meetings as far back as 1954, so we are unable to confirm that this report is accurate. Whilst it may seem unusual that such weight would be placed on the opinion of an employee who had joined the BBC that very day, Campey’s evidence is leant credibility by the near-convergence of Kneale’s independent account and Campey’s naming of the correct date for the making of the decision. Whilst we can’t be totally certain how the decision was made, we can at least speculate on the relevant factors that might have informed any such discussions based on pertinent background information. The BBC’s response to the Nineteen Eighty-Four reaction should be looked at in context of the only previous comparable scenario. This occurred in response to the 1950 television production of the political comedy Party Manners, which did have its scheduled repeat performance cancelled following adverse press reaction (although the exact correlation between one and the other was disputed).35 This led to a backlash that was far more damaging to the BBC than the limited objections to the original production. A recurrence of the same with Nineteen Eighty-Four was surely something the BBC would have wished to avoid. Michael Barry had been a senior drama producer (and soon to be Assistant Head of Television Drama) during the Party Manners debacle, and went on to write in his memoir that he and his colleagues had “watched this brouhaha with astonishment, and some awe.”36 He couldn’t not have had this in mind when the Nineteen Eighty-Four storm broke four years later. Val Gielgud, who was the Head of Drama at the time of Party Manners as well as being the play’s writer and producer, later wrote that “the failure [of calls to cancel Nineteen Eighty-Four’s repeat] was generally attributed to the precedent set in the case of Party Manners.”37 However, it’s unclear whether he’s referring to press and public comment or that from within the BBC itself. Wolfe-Murray noted that although not asked to do so, he had informed Cartier and the production’s three lead actors of the comment. Clearly, Kneale also learned of it, but the lack of any further reporting of the remark suggests it was restricted to a small group within the BBC. Needless to say, the comment cannot possibly have had any impact on the BBC’s decision to repeat Nineteen Eighty-Four as it occurred two full days after that decision was confirmed to the nation’s press. Equally, it did not change the tenor of press coverage of Nineteen Eighty-Four as the press were not made aware of it, and indeed there was no change in the tone of the newspaper coverage, only in the readers’ letters they published, as noted earlier. Another common myth is that the Nineteen Eighty-Four controversy was discussed in parliamentary debate. Hansard, the transcript of all debates in both Houses of the UK Parliament, confirms that it was not.40 However, again, the myth is only an exaggeration of reality. Then, as now, Members of Parliament could table motions for a debate or a vote in the House of Commons on a particular subject, but there was no guarantee that these would actually be heard, and indeed frequently they were not. However, the tabling of a motion, even where there is no real chance of it progressing, results in it being formally recorded, and therefore it may be reported in the media (which is often the tabling MPs’ hope, for publicity for their concerns). This is what happened in relation to Nineteen Eighty-Four. A motion may be tabled by a small group of MPs but others may propose amendments and counter-motions on the same subject, to air alternative views. Nineteen Eighty-Four prompted four motions, including amendments and counter-motions, and, unsurprisingly, these received significant press coverage, leading some people to believe a debate had actually been held in parliament. Some accounts suggest that the Nineteen Eighty-Four controversy helped lead to the breaking of the BBC’s monopoly with the introduction of ITV the following year. It is tempting to draw this conclusion in view of the number of comments made in newspapers that an additional television service would give viewers an alternative to such divisive programming, but there’s certainly no evidence that these reactions hastened the arrival of commercial television. Indeed, as noted in an earlier paragraph, this was already well underway by the time of Nineteen Eighty-Four. The legal framework for a commercial television broadcaster was created by the Television Act, passed in mid-1954, and from that point on the introduction of a second television network was assured. Indeed, by late 1954 the Independent Television Authority was already considering applications for the various regional franchises which would constitute the ITV network. So far, I have concentrated on the reaction to Nineteen Eighty-Four as it is there that the most interesting new information has emerged in my research, frequently contradicting received wisdom. However, before concluding, I will briefly consider some of the stories associated with the play’s production and recording. These can be harder to test, despite the existence of the BBC production file, because of the smaller number of sources of information and the fact that, sadly, most of the original production team have now passed away. Nigel Kneale recounted the story that when the snowstorm paperweight prop went missing, or was stolen, just before one of the performances, the only replacement that could be found featured Mickey Mouse, leading to the character’s incongruous appearance on screen in the apparently antique object. It certainly isn’t Mickey Mouse in the paperweight seen in the second performance, as the recording amply testifies, but we can’t rule it out for the first, for which we have no recording. Paddy Russell, who was floor manager on Nineteen Eighty-Four, also recalled the loss of the prop and she suggested it occurred on the first performance, with Kneale’s wife fetching a replacement from home as the shops were closed, being a Sunday.44 However, she inaccurately reports that the script specified a village should feature within the paperweight. This and the contradiction with Kneale’s account suggests that the details of both anecdotes should be treated with caution. A version of the anecdote was also told by Yvonne Mitchell, who played Julia. She too reported the disappearance of the prop and the need for a last minute replacement, but made no suggestion of any incongruity about the replacement.45 Special effects man Bernard Wilkie gives much the same account in his memoir and also notes that a member of the production team had to fetch a replacement from their home when one could not be found locally.46 Crucially, Mitchell locates this as occurring before the repeat, specifically citing the episode in relation to the increased studio security and changed atmosphere for the second performance. It may not be watertight, but this evidence indicates that the loss of the original prop did occur (and I personally find Mitchell’s account of it occurring on the Thursday the most compelling) but the suggestion that the replacement featured Mickey Mouse is not true. That anecdote was a trivial and fun one, which surely nobody really credited, so perhaps I should have left it to stand. However, a more interesting potential myth surrounds the recording of the play, which was done on the repeat broadcast, as referred to above, leaving the first performance lost to us. It’s commonly stated that it was the usual practice to record the second performance of a play, not the first, but we can’t rule out exceptions. In the case of Nineteen Eighty-Four, an internal BBC memo explicitly requests telerecording facilities for the 12 December performance (i.e. the first one) to record 20 minutes of the production “for archives”.47 Given that this request was made six weeks prior to the broadcast, isn’t referred to elsewhere in the file, and any resulting footage certainly isn’t known to exist, we could assume it was later cancelled. However, a newspaper report from two days after the first broadcast appears to confirm that a portion of the broadcast was recorded. On 14 December, the Daily Sketch reported that “only 20 minutes of it was telerecorded on film for technical and archive purposes, and this extract does not include the torture scenes.”48 Had the reference to a portion having been recorded been more vague, it could perhaps have been disregarded as a confusion with the pre-filmed sections, but the duration of the extract recorded tallies with the earlier request for a recording and the use of the correct technical term (‘telerecording’) for an off-air recording also lends the report credibility. Whilst we can’t be sure that a portion of the first performance was recorded on transmission, it remains an intriguing possibility that cannot be ruled out. Hopefully this rather lengthy article has brought some new information to light regarding Nineteen Eighty-Four, while also illustrating how anecdotal evidence can be cross-checked and challenged or verified by reference to objective sources, or at least alternative subjective ones. It may seem a mean-spirited or joyless exercise to dispute amusing or intriguing anecdotes connected to productions such as this, but for anyone whose interest in the subject of television drama goes beyond the level of simply watching and enjoying it, understanding the truth about a production that was as divisive, and as pivotal in the history of early television, as Nineteen Eighty-Four is surely important. It’s also exciting that, despite it now nearing its 60th anniversary, there are still mysteries surrounding Nineteen Eighty-Four, and fresh discoveries being made. If you have further information that gives a different perspective on any of the above, do please get in touch via the editorial address as we would be very pleased to learn of it and potentially revise this piece. With thanks to Mark Aldridge, Nick Cooper, Peter Crocker, Andrew Pixley and the BBC Written Archives Centre for research assistance. Originally posted: 1 October 2014. 5 Oct 2014: amendments, additions and deletions. These change two sections: ‘The question of the repeat performance’ and ‘Production and recording’ (in the latter, the second and third paragraphs have been created as a result of additions to the previous version’s second paragraph, and the final paragraph has been changed). Amendments include references to Coming to you Live! 12 Dec 2015: minor typographical corrections; replaced final sentence in paragraph that begins ‘On 14 December’. 11 Feb 2016: added sentence referring to Bernard Wilkie’s memoir. 13 Feb 2017: corrected ‘Sunday 13 December’ to ‘Monday 13 December’.